Data Deluge: Everything in the vertebrate eye means something. Except for the brain, there is no other organ in the body of which that can be said. It does not matter in the least whether a liver has three lobes or four, or whether the tip of the heart points north or south, or whether a hand has five fingers or six, or whether a kidney is long and narrow or short and wide. 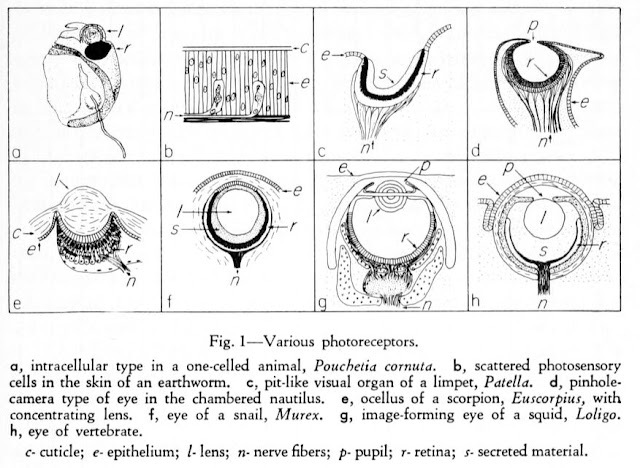 But if we should make comparable changes in the makeup of a vertebrate eye, we should quite destroy its usefulness. Man can make optical instruments only from such materials as brass and glass. Nature has succeeded with only such things as leather and water and jelly; but the resulting instrument is so delicately balanced that it will tolerate no tampering.